The United Nations has declared 2019 to be the Year of Indigenous Languages, with an official launch event taking place at the UNESCO Headquarters in Paris on January 28. The world does not have a great track record on indigenous languages. More than 90% of the indigenous languages of both the United States and Australia, for example, are extinct or endangered. We don’t even have a great track record on committing to support indigenous languages. In 1996, for example, a Universal Declaration of Linguistic Rights was drafted at a major conference in Barcelona, proposing that all languages should have equal status and rejecting terms such as “official,” “regional” or “minority” languages, but despite widespread support, it was never adopted by UNESCO. So 2019 represents an opportunity, or perhaps a challenge. 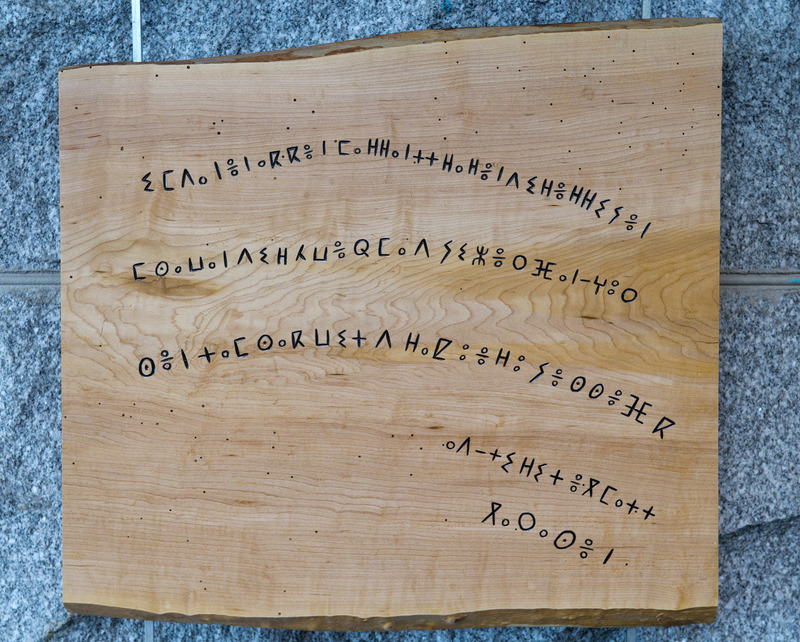 It especially represents a challenge to me as the founder of the Endangered Alphabets Project, a nonprofit based in the US state of Vermont — I exhibited some of my carvings at LocWorld in 2016 in Montreal, 2017 in Barcelona and 2018 in Seattle. As a way of kicking off 2019, I approached the Vermont State House and proposed an exhibition of my work that would run through the month of January, ending February 1. The state’s curator agreed, and I began planning which carvings to include. I’ve carved pieces of text (poems, proverbs, phrases and even individual letters and words) from indigenous and minority writing systems from more than 50 countries, so which ones made the most sense for the Year of Indigenous Languages? Article 1 in Tifinagh, a script used to write Berber languages. Even as I started getting these pieces ready for installation, though, I realized I was about to make a common and serious mistake. I was about to show people what was going on elsewhere in the world, but nothing about what is going on in their own back yard. The fact is, it’s far easier to complain about someone else’s treatment of indigenous peoples than to do something for one’s own. Virtually every country makes sure its own indigenous population is out of line of sight, out of the news and out of the history books. Two years ago it struck me that, despite my work on a global scale, I had been guilty of the same partial blindness. I had not carved anything in Abenaki. The Abenaki are indigenous to Vermont — and in fact to an area spreading from modern-day upstate New York to Maine, and across the border in Canada. Decimated and scattered by colonization, infectious disease, warfare and, in the 20th century, enforced sterilization, they are largely ignored and almost invisible. There are almost no college courses in Abenaki history, language or culture, for example. Their language is one of the most endangered in the country. I was ashamed to know so little and to have done nothing about what was happening in my own back yard. So over the past two years, with the permission and encouragement of some of the tribe, I’ve done several carvings that are on display in regional tribal headquarters and I’ve done one for presentation to, and display in, the State House. Even the design of the letters to be carved was an issue. Just as a number of sub-Saharan African nations have developed post-colonial non-Latin scripts of their own, it didn’t seem right to carve Abenaki words in someone else’s graphic tradition. Luckily, my designer Alec Julien and I were able to work with Elnu Abenaki member Melody Walker Brook, former chair of the Vermont Commission on Native American Affairs. She in turn reached out to a team of representatives from the Abenaki Nation of Missisquoi, Mohegan and Elnu, as well as other Abenaki, for input. The result is a font that incorporates Abenaki motifs from traditional artwork and beading — a custom Abenaki font. The carving now in the State House exhibition says “W8banakiak” — that is, “People of the Dawn Land,” the Abenaki description of themselves. As the focal point of the exhibition at the Vermont State House, I’m going to be giving a talk there at 4 p.m. about the Endangered Alphabets on January 17, accompanied by members of the Abenaki people. The event is also going to be the occasion for the unveiling of my online Atlas of Endangered Alphabets. For the past six months, my tiny team has been researching more than 120 indigenous or minority writing systems that are struggling to survive, and the Atlas, at www.endangeredalphabets.net, introduces these scripts and, more importantly, the organizations and individuals working to preserve or revive them.